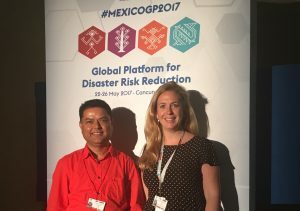 Last week our team presented at the Global Platform for Disaster Risk Reduction (GPDRR) conference in Cancun, Mexico. Background: The presentation identifies self-recovery drivers/barriers, drawing on case studies from the Philippines and Nepal, and aims to inform decisions about how to effectively support self-recovery and the construction of safer houses.You can find more information clicking here. Background: Poorly constructed buildings are often the largest cause of death, injury and loss of assets during a disaster. SFDRR prioritises the need to ‘substantially reduce disaster damage to critical infrastructure and disruption of basic services, among them health and educational facilities, including through developing their resilience’. It also identifies a need to ‘Enhance disaster preparedness for effective response and to “Build Back Better” in recovery, rehabilitation and reconstruction’. This event promotes the need for multi-stakeholder engagement, community-based approaches and partnerships to support building safer buildings, schools and hospitals, with policies and practices to reduce loss of life, assets and livelihoods. You can read more about this event by clicking here. There was a good sized audience and great questions after the presentation, with a number of people extremely interested in the project. A short article on Mapping (self-) recovery by Luisa Miranda Morel was also presented at the Children & Youth Forum in Mexico alongside the GPDRR. 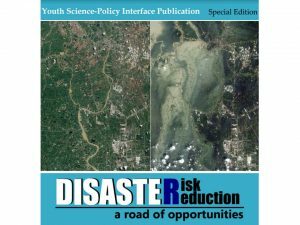 You can read it on the Disaster Risk Reduction: A Road of Opportunities magazine.